Livestock bells were once used extensively throughout the Australian countryside. The first ones were imported from England and America, but gradually local blacksmiths started turning out their own bells. According to legend, a test was carried out on top of Mt. Kosciusko to find the best bell maker in Australia. The two rivals were August Menneke of Wagga and Anthony Mongan of Albury. Menneke won when his bell could be heard ten miles away. August Augustus Menneke was born in Bakenem, Germany in 1838, and became a legendary bell maker immortalised by the likes of Dame Mary Gilmore and Alan Marshall. 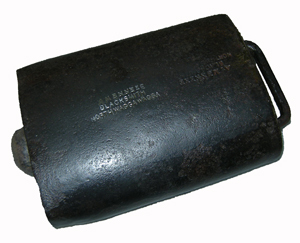 The Menneke bell was a favourite among bullockys and was nicknamed "The Wagga Pot". Menneke is still remembered throughout Wagga as one of the finest blacksmiths and legendary bell maker. He is one of North Wagga's favourite sons. The Menneke bell is of historic significance, relating to a time when Wagga was still a frontier society, and the village of North Wagga an important stopover for potential selectors, coaches and bullock trains. The bell was donated to the Wagga Wagga and District Historical Society in April 1970 by Fred Menneke, grandson of August and son of Bill (also a famous bell-maker). Fred acquired the bell after The Daily Advertiser ran a story regarding his search for an original Menneke bell (authenticated by the stamped initials 'AM'). This bell, discovered in Holbrook, was one of four uncovered in this search from centres as far away as Cloncurry, Queensland and as close as Wagga itself. Although this particular bell is not well-documented, it is rare as a surviving example of August Menneke's work. The Museum acquired a second Menneke bell in 2008 from the Angel family. This bell is fully provenanced, and was used originally on the 'Springvale' property of Edward Angel. Eventually this bell was passed down to Edward's son Harvey Edgar Angel, and then onto his son David Harvey Angel. Interestingly, David adapted the bell for use in gardening rather than around the neck of a bullock. Prior to donation, it was hung from a tree above David's vegetable patch and orchard. With the addition of a long rope extending to the house, birds could be scared away with a simple tug of the rope, when required! These bells are wonderful examples of the bells manufactured by August Menneke, and in their intact and original state, will continue to stand as a testament to the quality of his craftsmanship.